James Archer scored a crucial goal for Phantoms against MK. Peterborough sporting honour was swiftly restored by Phantoms last night (January 28). Hours after Posh had slumped to a dismal home drubbing at the hands of fierce rivals MK Dons, the city’s ice hockey team provided some welcome cheer. Edgars Bebris opened the scoring for Phantoms at MK. Phantoms collected a stunning 3-2 success at Milton Keynes Lightning in the English Premier League despite having a host of influential players missing. They travelled to face their fiercest rivals without import ace Petr Stepanek, and fellow forwards Will Weldon and Marc Levers. Defencemen Ben Russell, Scott Robson and Callum Medcalf also sat out a clash between the second tier’s second and third-placed sides. The long list of absentees didn’t stop Phantoms, who took to the ice seven points behind their big-spending hosts, from cashing in on an early powerplay as Edgars Bebris fired them ahead. 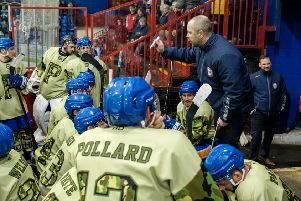 Their lead was wiped out by former Peterborough man Jordan Cownie a couple of minutes into the second period and parity remained until the final session. Phantoms regained the upper hand with two goals in little more than three minutes from James Archer and Wehebe Darge. Lightning did cut their arrears during a five-on-three advantage as Frantisek Bakrlik struck, but Phantoms held firm to claim a second success of the season on their arch-rivals’ ice. They also triumphed in Buckinghamshire on Boxing Day. The latest win moved them to within five points of MK in the standings while Phantoms also remain a point clear of fourth-placed Basingstoke. They entertain the reigning champions at Planet Ice tonight (January 29, 5.30pm).